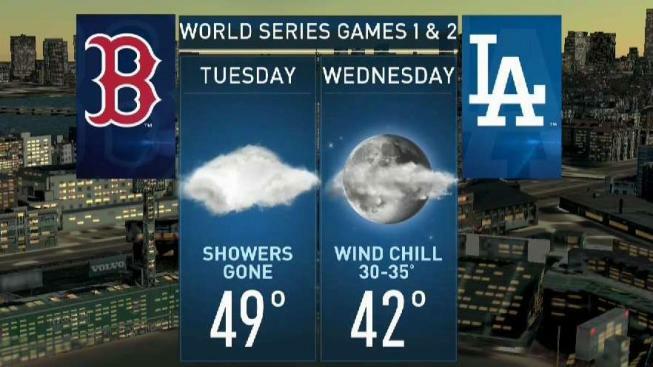 The Red Sox open the World Series against the Dodgers Tuesday at Fenway Park, and weatherwise, we know anything can go this late in October. It's been a long journey for the Boys of Summer, but their hard work and winning ways have brought them to the greatest series in baseball. The Red Sox open the World Series against the Dodgers Tuesday at Fenway Park, and weatherwise, we know anything can go this late in October. The coldest World Series for the Red Sox was back in 1975, with temps in the mid-30s. In contrast, the warmest ones they played were in 1916 and 1967, with temperatures in the low 80s. As far as we can tell, it hasn't ever snowed in any World Series contest at Fenway, and this year is no exception. We will, however, try to dodge (pardon the pun) some showers. Oddly enough, the greatest threat for them falls squarely in the late afternoon and early evening Tuesday. That doesn't promise wet weather for the first pitch, however. This is a narrow band of wet weather, and it is difficult to pin down to an exact hour or minute. We'll just throw out the worst case scenario and say that there may be a brief rain delay to allow the steadiest rain to pass before the first pitch. We're expecting 49 degrees with a light wind out to center field. Wednesday is dry, but a gusty wind will create wind chills in the 30s as air temps struggle to stay in the 40s.